VACUUM SINE PLATE CHUCKS & VACUUM PUMPS by Suburban Tool, Inc. 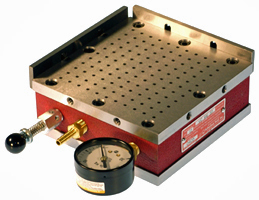 Provides an excellent means for holding non-magnetic workpieces for light machining or grinding. Designed to bolt directly to a SineSet® sine plate or compound sine plate of the same size & series with little or no indicating. Each chuck has three 1/4 NPT holes for mounting the vacuum gage, relief valve and hose fitting. The vacuum gage and relief valve included. All chucks have back and end rails for positive location of workpieces. All models are the oilless, motor-mount, rotary vane design for maximum performance with minimum upkeep. Each unit has internal mufflers and filters. The filters were specifically designed to be easily removed and replaced. 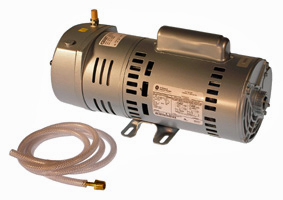 The pumps have built-in thermal overload protection. Each model includes a support base, the proper fittings and six feet of reinforced hose. NOTE: Because electric motors are dual frequency, multi-voltage AC for worldwide applications, they are supplied without an electric cord, ready to be wired to user specifications.